The Arts Lab is a Savanna Trust programme for professional development of performance artists. The programme provides training, a space to create new work, a platform from which to showcase talent, diversify income and institutional development. The programme combines performance training, with hands on training in arts leadership, management, production and arts-for-development. All training is linked directly to producing original work, and aims to serve both individual performers and existing arts groups and organisations. Arts Lab also provides links to regional and international practitioners and audiences, through training, collaboration and touring. Training is centred around the creativity of the performer, with a focus upon theatre arts and contemporary dance and aims to serve the artistic vision and growth of exceptional talent. Training is split between developing specific performance skills and conceiving, constructing, writing and rehearsing new work. Training and mentorship is provided by leading practitioners in Zimbabwe, and international experts in different performance areas. The Arts Lab brings together dancers, musicians, singers, actors, writers, visual artists which leads to exploration across art forms. Members of Tumbuka Dance Company have worked with performers from other renowned groups such as CHIPAWO, and New Horizons, as well as established solo artists like Edith Wa Utonga and John Pfumojena. The Arts Lab facilitates an experimental performance workshop space where creative visions are nurtured and artistic boundaries pushed. The result is fresh original work rooted in Zimbabwean contemporary reality. Those who have come through any part of the Arts Lab form the Arts Lab Collective which represents a pool of outstanding individual talent, managers and groups who can market, manage facilitate diverse arts-based programmes – for theatres, communities, schools, development partners, corporate partners, events, festivals. In 2012, a new dance group was formed through the Arts Lab programme. Smaller split off ensembles tour high density areas performing work developed in the Arts Lab workshop space, and the Arts Lab team are coordinating a programme to bring community groups to performances at central venues in Harare – this is attempting to bridge gaps across social, economic divides amongst audiences in Zimbabwe. 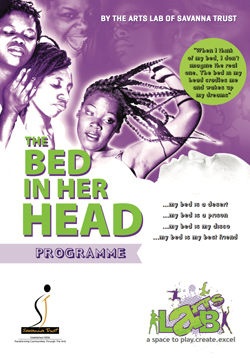 National tours of Zimbabwe are set for 2012, with two major productions in both dance and theatre. As well as performance training, the Arts Lab also provides training in using the arts for communication, education and development. This forms part of the hands on training in diversifying income. Through combined training and practise participants are develop their skills in the use of applied arts for individual and community development including forum theatre, issue-based performance for social change, drama and dance therapy, workshop facilitation, social research and project management. Performers attached to the Arts Lab programme lead weekly community groups in high density areas around Harare. These use dance and drama processes to explore social, personal, political, ethical, developmental issues, working in partnership with local institutions and groups. The programme is founded upon the belief that no artistic vision can be fully realised without sound management structures and no artist can realise their full potential if consistently struggling to make ends meet. A core strand of the Arts Lab’s work is to provide arts management training to artists and groups. Through programme and proposal development, strategic planning and its training-in-residency model the Arts Lab facilitates organisational growth of arts groups. The programme brings arts professionals with internationally renowned professional experience, whose work and track record is outstanding, to build capacity in arts management and artistic leadership for each sub-sector in Zimbabwe. Consultative, needs-based and relevant, the Arts Lab concept was developed alongside The Culture Fund and The British Council after extensive consultation and research within the Arts and Culture sector in 2011.